I am excited to see the live-action adaptation of Beauty and the Beast later this week, and have come up with the perfect cookies to celebrate the occasion. When you want to have an Anne of Green Gables party, (because it is of course when, not if), here are my suggestions for elements that you can include, based on recent parties I’ve organized for myself and some of my friends. First of all, PUFFED SLEEVES! Don’t let Marilla tell you that it’s a waste of fabric. You know watching Anne recite “The Highwayman” at the White Sands hotel and Gilbert lead the standing ovation afterward will be way more fun if you and your friends are wearing giant puffy sleeves while you watch it. My easy, no-sew tutorial video for sleeves that you can pop on over any outfit is below, (filmed & edited by Bianca Brown–thanks, lady!). The elastic should keep the sleeves on well enough for movie-watching, but if you’re going to be wearing them while being more active, such as three-legged-racing with your new bosom friend or climbing onto roofs to walk ridgepoles on a dare, you may want to use a safety pin or two to hold them in place. I did it! I finished the 13 dwarf beards in time for the midnight premiere of The Hobbit: An Unexpected Journey. It took me five and a half weeks overall, but I didn’t work on them every single day during that time. I didn’t do much of anything else in my free time, though. All the hard work was definitely worth it; they looked great, (not 100 percent accurate, but overall pretty close), and wearing them with a big group while in line for the midnight showing was just as much fun for everyone as I had hoped it would be. This is going to be an image-heavy post, but I’m just so proud of the work I put into this event, I want to be sure it’ s documented. And if anybody is planning a Hobbit- or Dwarf-themed party, maybe this will give you some ideas. Kili. 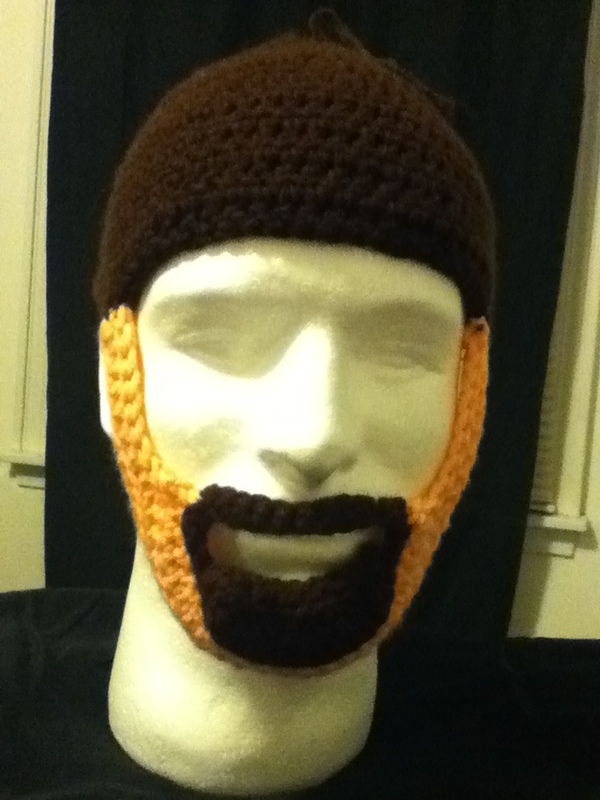 I gave him a goatee because I wasn’t sure how to crochet a five o’clock shadow, and I didn’t want him to be the only one without a beard section. Fili. Originally wanted to untangle the yarn on top that is pulled back, because movie-Fili’s hair is kind of wavy there, but I ran out of time. Love his braided mustache, and I love this yarn color. Oin. some of his mustache strands have craft wire in them. The lighter gray strands of unbraided mustache on top are actually hot glue-gunned onto the braid beneath them to keep them in that round shape circling the mouth. 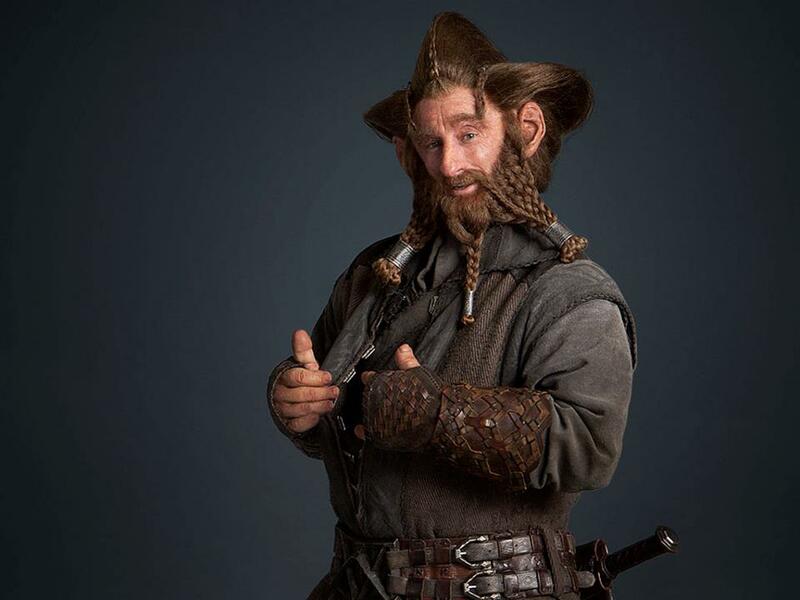 I noticed during the film that one of the dwarves had a kind of spiked curl in the back of their head, and I think it was Oin, so I might need to add that for next time. Gloin. I realized after I finished this one that those three small bundles on either side of his mouth should actually be braids, not loops. Love this color of yarn, though–I used the same color for Nori and Ori, and working with it always made me want to eat a pumpkin muffin, because the color is called Burnt Pumpkin. Dwalin. Couldn’t figure out how to add tattoos to the scalp part. Balin. I curled the ends of the beard by dipping them in a mixture of water and glue and wrapping them around wax-paper-covered rolls of toilet paper to dry. Bifur. I don’t think his beard cuffs got enough silver spray paint, and I didn’t manage to figure out how to include the axe head that is supposed to be imbedded in his forehead. Maybe I can work something out by next year. Bofur. The braids have craft wire in them, and the mustache was formed separately with glue and let dry, then hot glue-gunned onto the upper lip crochet base. You can’t see it in this picture, but he’s got another braid hanging down in the back. Bombur. Hard to tell in this picture but he does have a “bald” spot on top. I ended up making another, bigger neck-braid too, but that part was pretty simple. And I know for a fact that Stephen Hunter approved of this creation, because he favorited my tweets of it. Nori. Definitely the most complicated design, so I was the most proud of how this one turned out. The cones are crocheted and stuffed with batting. He’s the only one I made eyebrows for, since they had to be braided back into his hair! Ori. This was the first one I added extra yarn “hair” to, and I was originally planning to do this de-tangling of the yarn for all of them, to make them look more like hair. But it took way too long, so I didn’t do it on the rest of them. Adam Brown re-tweeted a picture of this, too, so it must have turned out good enough for the real Ori! Dori. Had to show off the multiple angles! This was one of my favorites. I just think it looks so cool! I don’t have the braids replicated exactly right but I’m pleased with how it turned out. The silver cuffs on all of these were made by first squiggling designs with Elmer’s glue onto white cardstock to create texture, then after the glue dried I spray-painted the whole thing silver. If I had more time I might have tried to match the actual cuff designs, but the random glue squiggles still look pretty cool. Thorin Oakenshield. Should have made his braids a bit longer, and I noticed while watching the movie that it looks like maybe he has a bigger braid or two in the back? But I love the gray streaks that I included at his temples and forehead. Our company of dwarves was first in line at our chosen theater, although not all 13 dwarves were there right away. After the sun went down it was pretty cold, but the beards helped keep our faces warm, and I had arranged for a friend to deliver us hot pot pies, (because it sounded like a hobbit/dwarf-ish food), when there were still about four hours left before the show started. We also had somebody bring us hot chocolate, which we shared with the people behind us in line. Themed activities that we did to pass the time (and to give me an excuse to hand out prizes) included an archery contest, (we shot at a goblin target with a toy bow and arrow, and the grand prize was a Kili action figure), a warrior attack contest, (charging at the same goblin target with a chosen fake weapon from our stash and seeing who had the best style), playing a dwarvish rune-based memory game (I made the cards based on the movie’s “dwarvish word of the day” from the facebook page), riddles, and trivia. And anybody that could correctly name/identify all 13 dwarves got an edible pipe. We also traded some edible pipes for lembas bread from some elves that were a few groups behind us in line. We also had an on-going burglary competition, but the caveats were that you had to be wearing your beard at the time and you couldn’t actually steal anything serious. (The winner ended up being a sneaky little dwarf who drank half of somebody else’s soda before they noticed, and the prize was a Bilbo action figure.) Other prizes were posters, some of them small ones that I made by cutting up a Hobbit movie calendar–I don’t exactly have an unlimited party-planning budget. Front and back of Sting prize; hold it silver-spray-painted side out when all is safe, but flip to blue cardstock/candycane to signal that orcs or goblins are near! Edible pipe, made from brownie cooked in mini-muffin pans with reese’s peanut butter cups at the center for the “tobacco.” I stuck pretzel sticks in the reese’s when they were still warm so that it would harden around the pretzel, then dipped the pipe “bowl” in almond bark to reinforce it. Tedious, but they turned out pretty well and they were a hit. Another snack idea that I thought of but didn’t have time for was stone trolls; I was going to make rice crispies and cut them out using a gingerbread-man cookie cutter, then dip them in white chocolate almond bark with a little bit of candy food coloring to make it gray, so that they resembled Bill, Tom, and Bert after they were turned into stone. I thought about dipping all but their feet and calling it “Trolls at Sunrise,” but I didn’t end up having time to do any of it, and that’s not a snack that will be appropriate next year for part 2 since the trolls are only in part 1. I can re-use the pipes and candy-cane Stings ideas, though. Ori enjoys an edible pipe. Fili sneaks up on the goblin for a surprise attack with a glowing Sting, (which I got over at thinkgeek.com). I painted the goblin based on the Grinnah action figure. The Dwarven rune-based memory game cards; basically I copied the runes, pronunciation guides and meanings provided by the official Hobbit movie facebook page, and found pictures to match the meanings. I put the runes and the pronunciation on the cards with the pictures too so that anybody could make a match regardless of previous rune knowledge. The cards are printed on colored cardstock so that you can’t see through them when they’re flipped over to cheat, and laminated to make them more durable. I’m definitely going to save the beards for next year when part 2 comes out, although personally I’d like to go to that one in a Smaug costume if I can, although I have no idea at this point where to begin crafting on that. I’ll probably tweak the beards to improve them before then anyway, especially now that I’ll have a lot more reference pictures from multiple angles to work with from the first film. And we didn’t have a Bilbo or a Gandalf this year, so maybe they can be added as well. 13 dwarves wearing pagelady’s beard creations and 3D glasses in the theater for the midnight showing of The Hobbit: An Unexpected Journey. This project was a lot of work, and sometimes it seemed ridiculous or frustrating that I was putting so much effort into something that might seem silly or fleeting. But if you watched the Hobbit production videos like I did, you have an idea of how much work by how many people goes into making these movies that we love. And I think this is the best way to honor and appreciate the hard work that those people did–not just Peter Jackson and the cast, but also the people who did make-up, lighting, sound editing, digital enhancements, and every little step along the way, for months and months–by putting in a lot of hours myself to enjoy experiencing their work to the fullest. And the highlight of the night for me was when the official Hobbit movie twitter account acknowledged all my hard work with a “so great!” stamp of approval. NaNoWriMo Fail, Midnight Hobbit Showing Win? There’s no way I’m going to reach 50,000 words in the few days remaining this November NaNoWriMo month. I’m okay with the failure, though. I intend to keep plugging away at my story on lunch breaks and weekends that aren’t already full. I just wasn’t able to get much writing done at all in the last week, because as I predicted, my dwarf beard project took over. 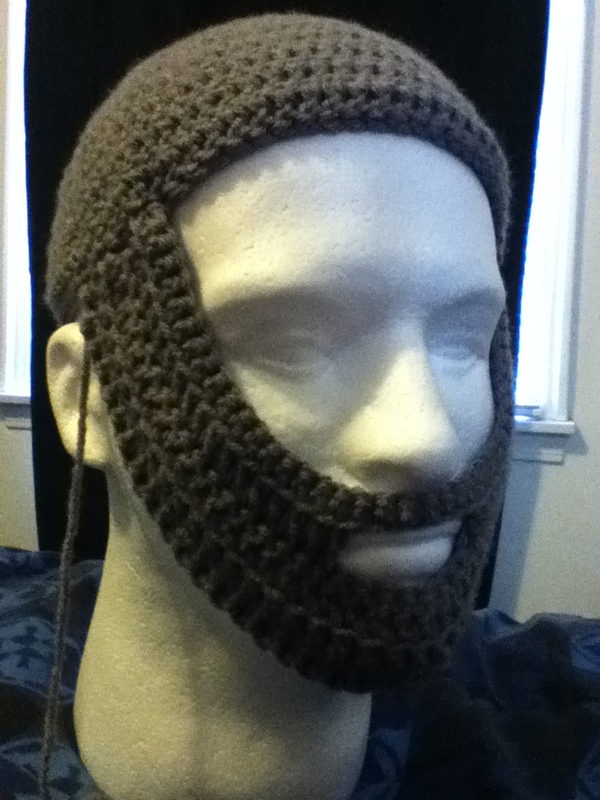 One cannot commit to two massive time-consuming projects concurrently with any success, or at least not if one also wants to continuing such habits as “sleeping at night.” So, yes, I chose to crochet dwarf beards and sleep when I wasn’t working this last week. The beards have a December 13 deadline, and even though I did nothing but work on them through this whole four-day Thanksgiving weekend I only have 1o of the 13 crocheted, and then there’s still the additional, who-knows-how-much-time-it-will-take step of adding yarn “hair” to be braided and styled for each character. I’m pretty sick of yarn at the moment, and depressed about the likelihood I will be able to finish or that they will turn out looking great. But, extreme pessimism is a natural phase of my party planning method. I come up with great ideas, I start executing them, and in the middle I think it’s all total crap and too much work and why do I even bother, but then (usually) it turns out fine. This is basically what the crocheted structure looks like for all of them, in various colors depending on the character. I think this is Oin’s. 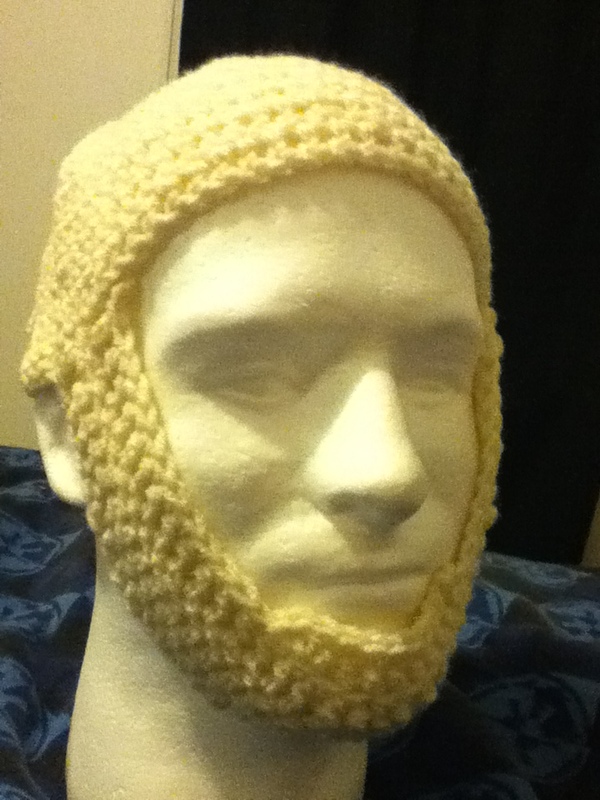 This is Kili’s; I’m cheating and just giving him a goatee because, really, how does one make a 5 o’clock shadow out of yarn?! Bless you, Balin, and your lack of a mustache, which makes it so much easier! The one that’s worrying me the most right now is Nori, because I’m just not sure how I’m going to do the three cone things with the hair on his head. I’m also going to have to crochet eyebrows for that one since his eyebrows are braided back into his hair, which is just so…dwarfish. Nori character poster from The Hobbit. Activities I’ve thought of so far include dwarf markmsanship, (recycling my toy boy and arrow from The Hunger Games premiere and aiming at a goblin target; potential second round could be throwing a foam axe at the target, assuming I can make a foam axe in time…), riddles in the dark, (obviously! Although it probably won’t be dark, and I’ll just have people pull a random riddle out of a jar to test their opponent with so it’s fair and they’re all guessable), a rune memory game, (I’m thinking I could use the Dwarven Word of the Day posts on the official The Hobbit facebook page to create cards where you have to match the runes to a picture of their meaning; I could include the runes in smaller print on the picture cards to make it do-able for anyone regardless of rune knowledge, but people who studied up would have an advantage), and then maybe something like who can pose for the best picture or who can read a passage from The Hobbit in the best dramatic voice. I want to do something with music, too, especially since the soundtrack will be out by then, but how do you make that a game? “Describe what you think is happening during this song”, most creative answer wins? Maybe we can all just sing the Misty Mountain song from the first trailer together. And for that we all win the prize of being awesome. As far as themed snacks, I’m trying to come up with a way to incorporate Sting with something blue, like maybe blue raspberry candy canes with handles attached to make them look like swords? I’m definitely going to have an accomplice bring us hot pot pies to eat at some point, possibly with runes carved into the tops for air vents. Maybe I could do something with the trolls or the ring, since they’re sure to be in this film and I haven’t incorporated them yet…or Gollum, for that matter. If I can’t come up with something better, I can always just make sugar cookies in whatever shape is needed, but sugar cookies are so unimaginative! Maybe there’s a way I can make dwarf axes out of, like, pretzel sticks with candy bars on top? Help me out–if you have ideas for Hobbit-related snacks, (other than the infamous Denny’s menu), let me know in the comments. Despite the temporary depression I’m feeling due to the intimidating amount of preparation I need to accomplish during the next three weeks, I’m incredibly excited for this movie to come out. I watched the extended editions of The Lord of the Rings two and a half times each this weekend while I crocheted, first just with the film, then with cast commentary, now I’m halfway through the director and writer commentary. I love these filmmakers and I love this franchise, and I can’t wait to see their latest portrayal of Middle Earth while I sit with my face covered in a yarn beard surrounded by fellow nerd friends. It’s going to be awesome.